The arrival at Blenheim is up a long drive through a park laid out by Capability Brown fifty years after the house itself was finished. It has his distinctive ‘natural’ landscape of gently rolling grass with lakes and carefully placed clumps of trees. The approach to the palace itself by contrast is theatrical, almost a stage set. On all sides are spires and columns, statues and golden balls, lions of England holding French cockerels in their paws, and battle honours carved in stone. A vast courtyard with colonnades on each side leads up steps under a tall, pillared loggia and through double doors with intricate brass locks into the Great Hall. 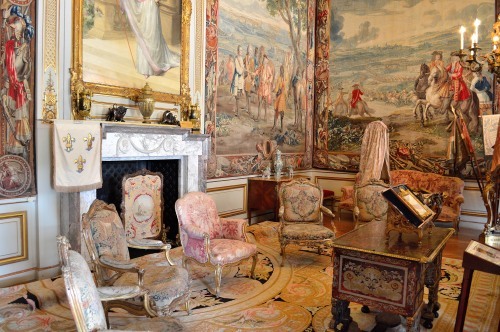 The Great Hall of the Blenheim Palace is the most majestic room in a house almost overburdened with the majestic. Facing the entrance doors is a pillared archway with a coat of arms in stone. More columns are to the left and right. A bust of the first Duke is set over a marble doorway. Then your eye is drawn upwards, past high windows, to the ceiling nearly seventy feet above. Here there is one huge oval painting that at first glance looks as though it depicts a classical scene with warriors and half-naked women, a snorting horse, and a triumphal gateway with a flight of steps leading to it. A soldier is kneeling, hands outstretched, pointing to a scroll of paper held by an angel. Opposite him a formidable woman, also helmeted, is holding a wreath and a spear. On the scroll of paper you can just discern the markings of a map with a few red lines drawn prominently across it. It is Marlborough presenting his battle plan for Blenheim to Britannia, the lines on the map showing his and the enemy’s troop dispositions. It is an image so pretentious as to be almost comic, but in keeping with the style of the house it succeeds as a superbly confident tribute to Marlborough. From the Great Hall stretch rooms of incomparable grandeur, with gilded friezes, multicoloured marble fireplaces, tapestries showing, as you would expect, scenes of battle and surrender, more marble doorways, spectacular chandeliers and sparse but ornate furniture. Every item is exciting and exuberant, and none is discreet or delicate. No wonder this English baroque style did not win favour with the refined generation of Englishmen who dominated building during the rest of the century. One of the many advantages of being an offshore island of Europe, unconquered by an enemy since 1066, is that it has allowed us to absorb influences from the rest of Europe without being dominated by them. Our buildings reflect this. Italian plaster work, Flemish gables, the flamboyant baroque, classical Greek and Roman designs, Gothic, and in more modern times the pure, almost abstract shapes first taken from Germany’s Bauhaus school have all had an influence. We have absorbed and adapted but never slavishly followed these trends. The exception is Georgian building, which ultimately became almost besotted with one particular style: the pared-down, simplified form of classical architecture known as Palladian. 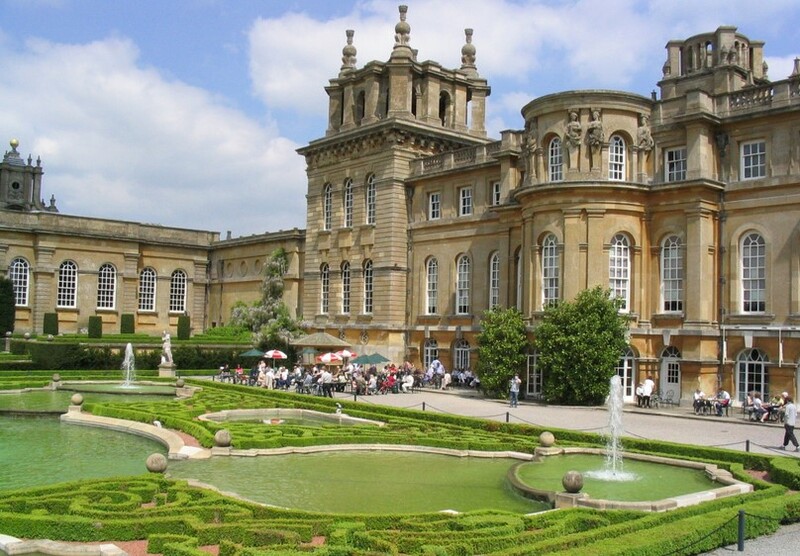 Blenheim Palace is today home of 12th Duke of Marlborough and his family. The Palace, Park and Gardens are open to public. From February-September enrich your visit with one of our new tours of the Private Apartments, taking place at regular intervals throughout the day. ‘Upstairs’ and ‘Downstairs’ tours, Palace State Rooms tour and Churchill exhibition are also available for visitors.